Trap your friends inside your phone? Yes! Like they are stuck in there forever and like they are trying to come out of it. 😀 What all you need? Well, a smartphone, a glass (a window or car could work! ), and a bunch of crazy friends! You can take photographs of your friends with their face squished against glass, let it be your window glass or your car glass, anything could work. 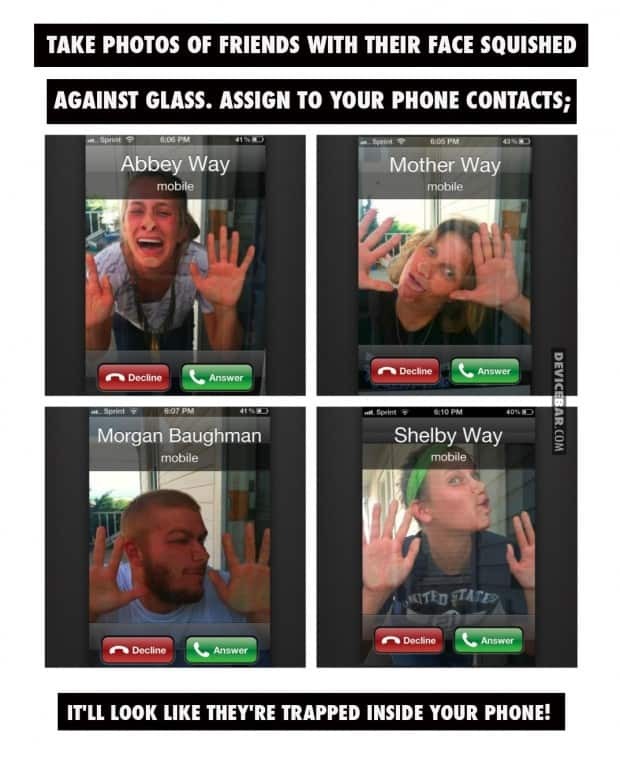 Then assign those photographs to your phone contacts. Hurray! Now it’ll look like they’re trapped inside your phone! VIEW LARGE VERSION / Here’s How You Can Trap Your Friends Inside Your Phone. Do try this with your friends and share the screenshots. If they are good enough we’ll be happy to share it on our official Facebook and Twitter profiles. Note: This caller UI may not be present on all the smartphones.